We started preparing for the Bhoj around 12:15 when P’s younger cousin walked me to the local beauty parlor, a small shop tucked off one of the main neighborhood roads. The shop was barely big enough to fit the four parlor chairs (which were computer/office chairs) and the small sitting area for waiting customers. Since my hair was “so soft” and apparently slippery to handle, the beautician slicked my hair with about a bucket of hair gel, then divided my ponytail into sections and rolled each section into a tight loop and secured it with bobby pins so that the final product was a large circular pun that looked weaved together at the center. 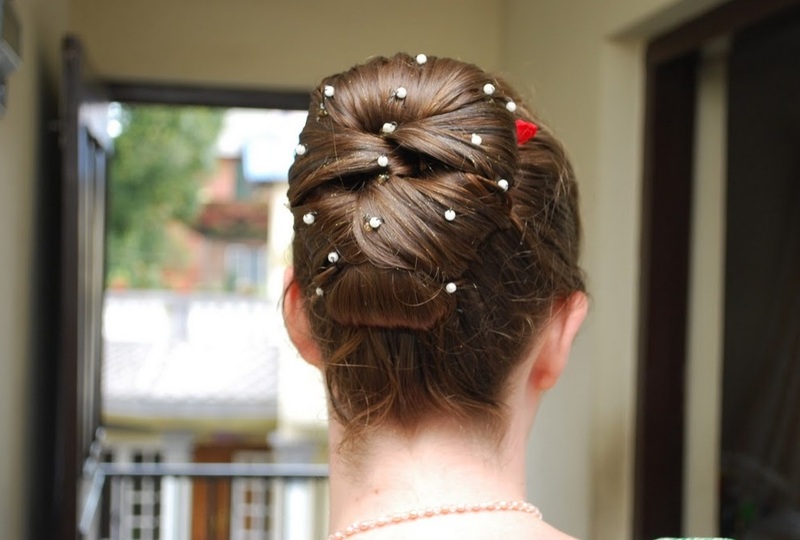 She added small pearl pins and small red fabric flower pins to give it some color and design, and finished it off with glittery hair spray. When I got back to P’s place, his mother told me it was time to do the rest of my preparation. The two women who help in the house sat me down in P’s parents’ bedroom. 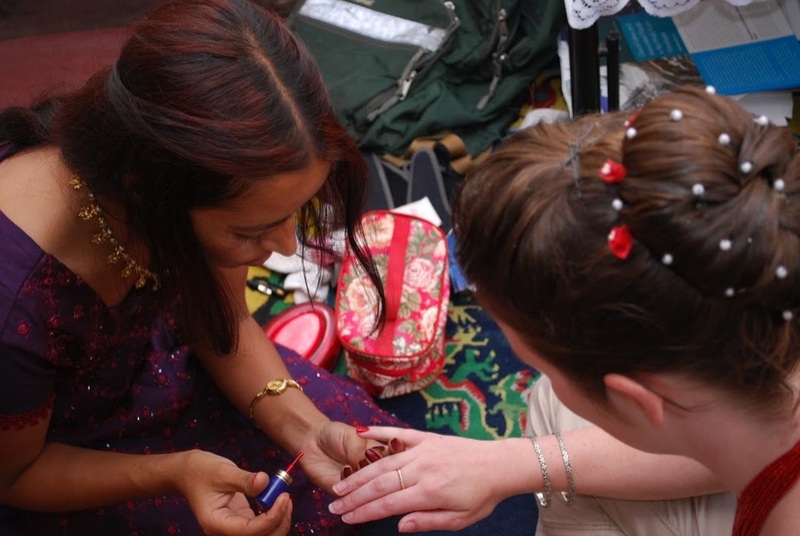 One woman—L Didi—gently strung a long red pote necklace over my head and new hair style while the other painted my toe nails and finger nails fire engine red. As my fingers and toes dried P’s cousin (the one who took me to the beauty parlor) and the women who painted my nails debated over what make-up would look good on me–in a place where my pale-as-a-ghost skin color sticks out like a sore thumb, make-up shades take some deliberation. The nail polish woman powdered my face and P’s cousin started putting pale sparkly eye shadow on my eyelids. The woman took some kajol (eye liner) and lightly lined my eyes and put mascara on, while P’s aunt and mother debated over what shade of lipstick I should wear. I vetoed the first bright red one, and agreed to the lighter more natural looking pink. With makeup done the extra women left the room while I put on my red petticoat and blouse. L Didi is the resident sari expert in the house and generally helps Mamu tie her saris (Mamu feels more comfortable in salwar kameze and usually wears those instead of sari on a daily basis). The last time I was here L Didi tied my saris, not because I didn’t know how, but because I was too slow, and her sari fixing looked nicer. L Didi wrapped me up and made sure everything looked correct, occasionally patting me on the hip and saying, “dheri ramro cha” [very nice]. L Didi, getting the job done nicely. Getting wrapped and fluffed up by others makes me feel like a living doll, but this was their family’s wedding party and I was ready to go with the flow. Everything looked so nice once they were done anyhow. One I was finished everyone else had to get ready—P’s mom’s hair was done by the woman who painted my nails, P’s cousins got in their saris– hair was curled, makeup applied, high heeled shoes put on. By 4:30 we were all ready to go. 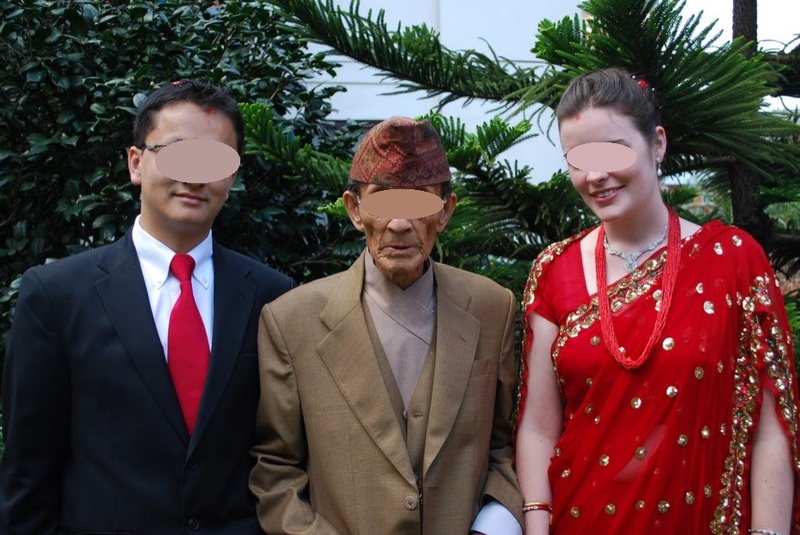 With P and his grandfather, waiting for the car to the Bhoj venue. 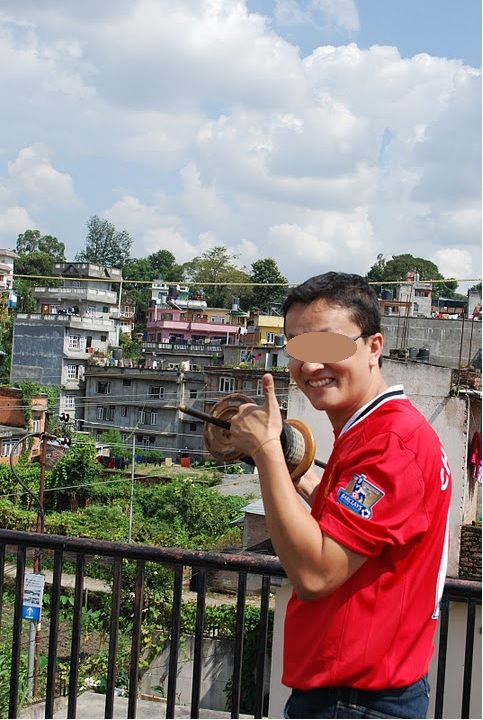 P returned home safely on Thursday, just in time for Tihar. Sampson and I are very happy to have him back. He also brought home the camera, so now I can share some photos from our trip. This will hopefully inspire me to finish the half dozen posts I have partially written about the rest of our journey. Thumbs up can only mean one thing... "chheeeeeeeet!" In the US we have turkey for Thanksgiving, and some people have ham for Christmas, but in Nepal when it’s time for Dashain only one kind of meat will do—khasi ko masu—goat meat. In preparation for the main day of Dashain, called Dashami—tikka day– P, his dad, his dad’s friend (“Uncle”), and I went to the Khasi Bazaar [Goat Market]. The market consisted of the sidewalk on both sides of the road filled with roped up tarp tents and lines of goats tied to strings and posts. A second part of the market was down a small alleyway where goat pens where stuffed with goats. Small weighing stations consisting of a metal cage for the goat, counter balanced by a platform and heavy metal weights were scattered throughout the market so customers could buy their animal by the kilo. We circled around the market for a while, and finally settled on a goat that they had spotted earlier. It was a darker brown goat with even darker brown, almost black, streaks, and small horns. The goat was untied from its post and Uncle picked it up to test its weight. Then the goat was ushered into one of the metal cages for an official weigh in. P’s dad haggled the price, and the goat was ours. 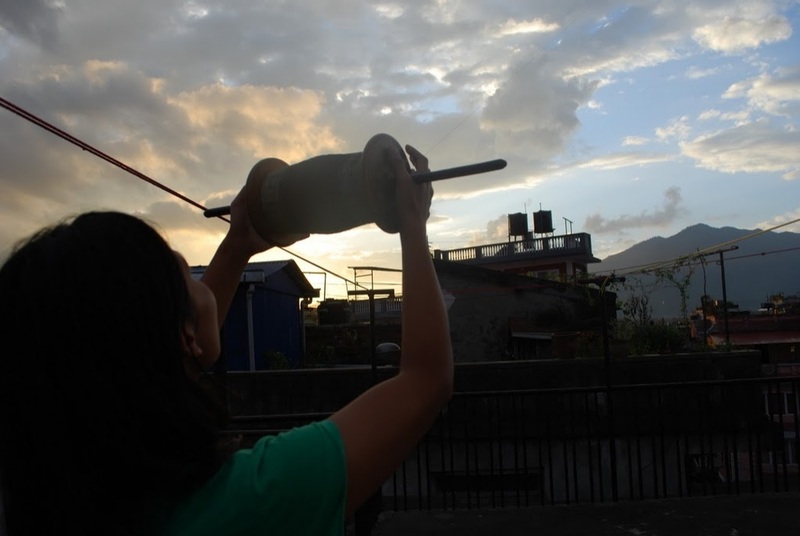 I took its rope and gently led it out of the market saying, “Aao khasi, aao.”[come goat, come]. I wanted the goat treated nicely since it only had a few more hours left of its life. We found a taxi and opened the back hatch and loaded the goat in the back so that it was standing behind the back seat and on top of the spare tire. There was just enough space in the back section of the taxi for the goat, almost like the space was designed for goat travel. P’s dad, myself and P sat in front of the goat on our way home. I pet its head to make it feel more relaxed. When we got home the goat was unloaded and brought to the back of the house to eat some grass. P and I pulled up clumps from the ground and put our hands up to the goat’s mouth and he happily chewed. After a few minutes P’s dad lead the goat inside the house and two people—P’s dad pulling the string from the front and “Uncle” swatting at the goat from the back—led the goat upstairs to the roof. The goat was tied in the corner and Mamu give it leaves from the cauliflower she was cleaning for Dashain meals, and we gave it a large pan of water. It bleated a few times then settled down in the shade. “Khasi is thakai.” J Phupu said [goat is tired]. When I pass the goat on the way up to the second roof top (above the kitchen) where P is flying some changa [kites] I feed the goat some more cauli leaves. Tomorrow the goat will be cut up for Dashami meat, some going to Uncle, some going to P’s relatives, and the rest eaten for the holidays. Daddy said in the morning he would take the goat to the butcher to be killed, cleaned and to have the larger sections of the goat separated (head, thighs, mid-section, etc), but that he was going to Uncle’s house to get a khukuri knife so that they could cut up the larger sections from the butcher into smaller sections. “You will see, tomorrow.” He said. My boss couldn’t believe that when P’s parents decided to do the bhoj that P’s dad could pull out a notebook and from memory write out a guest list with 550 people. “Who can do that?” he asked. I was equally impressed/shocked that in the two and a half weeks time after P’s family decided to do the bhoj, they were able to organize a party for 500 people, including printing out wedding invitations, addressing each one, and distributing them out to friends, family, and neighbors. The process is pretty interesting. Most people live in the KTM Valley, and although the Valley is terribly congested with traffic, and can take ages to make it across the city, it’s relatively easy to connect with people. By the time we arrived in KTM P’s dad had already printed the cards and addressed most of them. Instead of putting mailing information, you put family names, and group them together into packets for neighborhoods or friends/family that people will see. For the next three or four days Daddy was busy entertaining visitors who would come and collect a packet of invitations (Daddy would look through the packet to verify that the visitor would see all the people, and ask if there was anyone else, and look through other packets to collect those cards), and taking packets of invitations with him as he ventured out around the neighborhood with an umbrella in the lingering monsoon rain. At each house he would make small talk, perhaps have a cup of tea and/or a snack, and drop off the card. As the days progressed the giant stack of invitations grew smaller and smaller. P’s dad started calling people who he didn’t think he or a local acquaintance would see before the party. P and I got in a taxi and ventured to a few houses and work places of our friend’s parents to drop off invitations. I guess that is how you spread the word about a party in less than a week, and since most people are in the Valley, traveling to the party isn’t usually that difficult. However there has still been a lot of rain. Usually in the evening the sky will open up with a downpour. I’ve heard that when it rains people are less likely to go out because many people travel my motor scooter which would get messy in the rain, and getting very dressed up and going out in the water would also be uncomfortable. I’m keeping my fingers crossed that it won’t rain, or that there will be only a little. After all P’s dad’s hard work, I’d hate for weather to keep people away. I’m sitting on the roof now typing this post out on my laptop and the sky is fairly blue and clear. The party is tonight. I’m both excited and a little nervous. P and I will be sitting on chairs in front of a big hall of people eating and drinking. 500 people, most of whom I don’t know, coming up and greeting me and saying hello. If there ever was a time I wish I spoke better Nepali, it would be tonight when greeting all these new family members. The past few nights there have been conversations amongst the family members about what jewelry I should wear, and how I should wear my hair and if I should go to a beauty parlor. I smile and nod. I don’t understand all of the conversation, but I think it should be fun. After lunch P’s cousin is taking me to the beauty parlor for hair and makeup. I’ll post some pictures, but probably not until we get back home as the internet at P’s house is relatively slow. This afternoon the sun was high and warm, with just enough breeze to get a kite into the air. 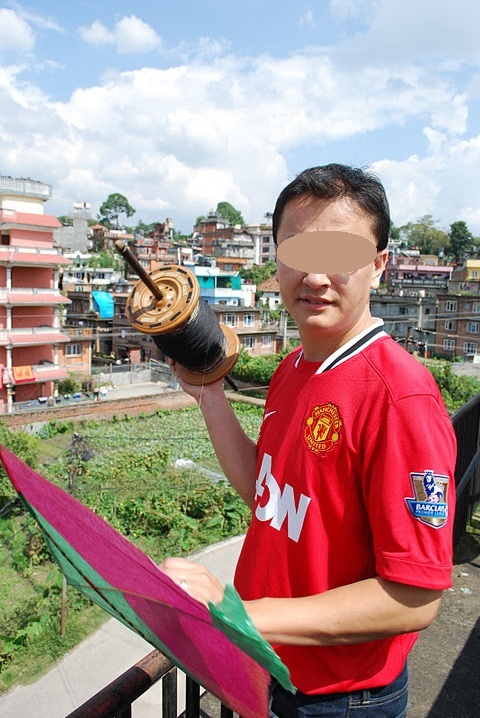 In preparation P and I wound the nice Lucknow string around P’s old wide wooden spool and took another kite up to the roof. “What if it is a little baby flying the kite?” I asked. “There’s no mercy.” He said, again smiling, but steered his kite away and over towards a light blue/gray kite launched from another roof not too far away. As the blue/gray kite climbed higher, it made its way closer to P’s. 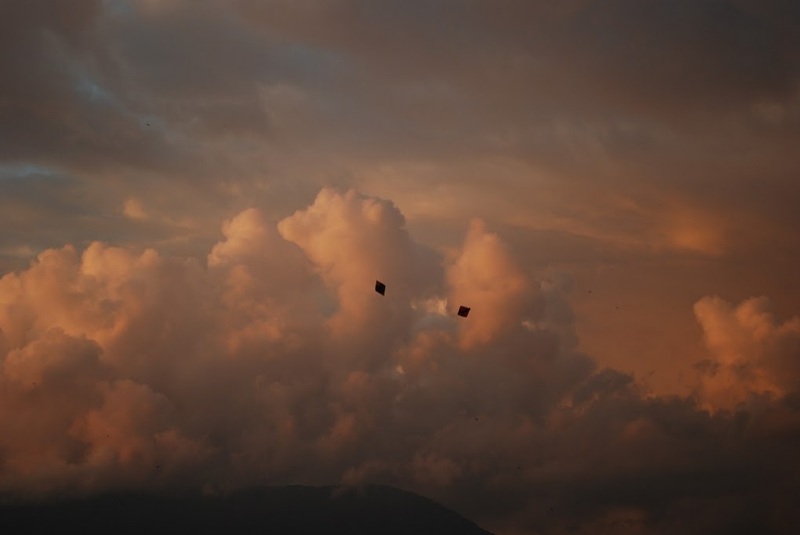 The kites circled each other several times, dancing in the sky. “When you cut the string of another’s kite you are supposed to yell ‘changa chet!’ which means ‘kite is cut!’” P explained. He pulled up and tugged hard on the kite and his string ran straight into the other kite with a force that visibly shook the blue/gray kite, even from such a distance. P’s spool started to pull and the string began unraveling rapidly. He pulled and then loosened, pulled and then loosened, and then the blue/gray kite started fluttering down out of the sky. P looked around for another kite to fight but the others were too far off. “Do you always have to fight them?” I asked. “What’s the point of flying if you don’t have the competition?” he answered. 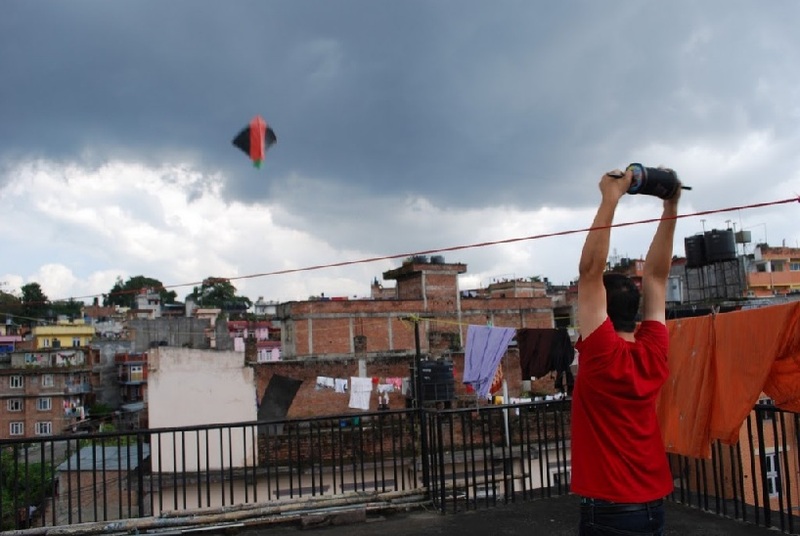 This type of kite flying was quite different then the few kites I tried to fly as a kid in the park, the point was just to get the kite up in the sky and watch it float in the breeze. 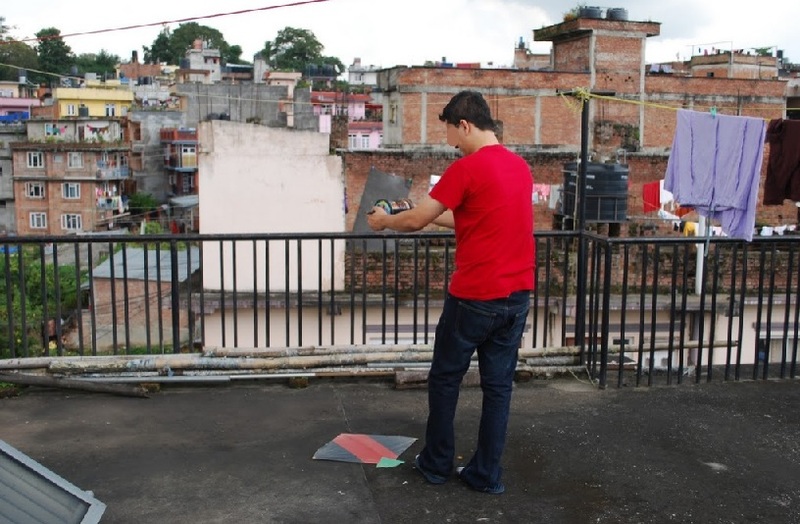 There wasn’t really any technique or skill involved, like this kite flying. 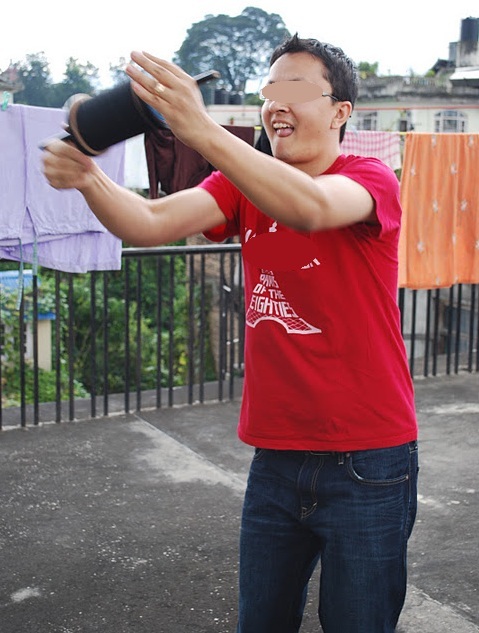 Every time P let me hold the wooden spool I’d again get the kite in a dreaded death spiral. I was content just to watch and cheer. We let it fly for a while more, then P reeled in his kite, alive to fight another day. 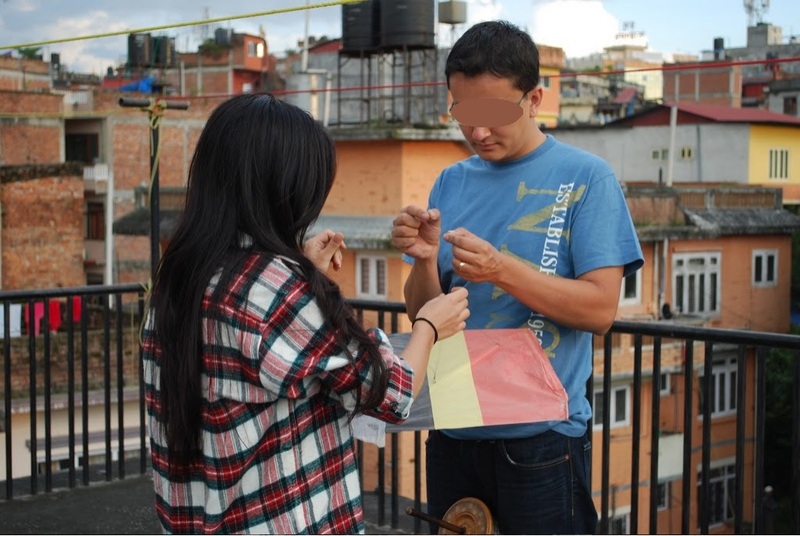 Vijaya Dashami, Now Go Fly a Kite! 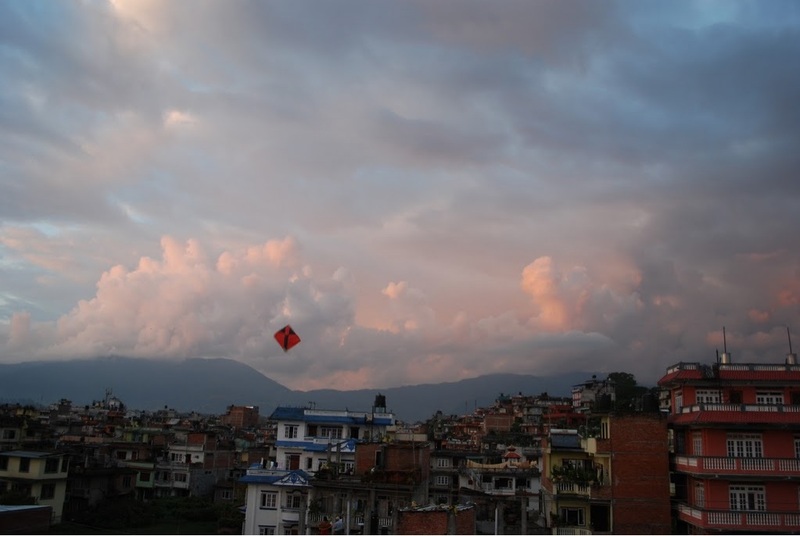 Today is the first day of the fifteen day holiday Dashain, one of the largest festivals of the year. 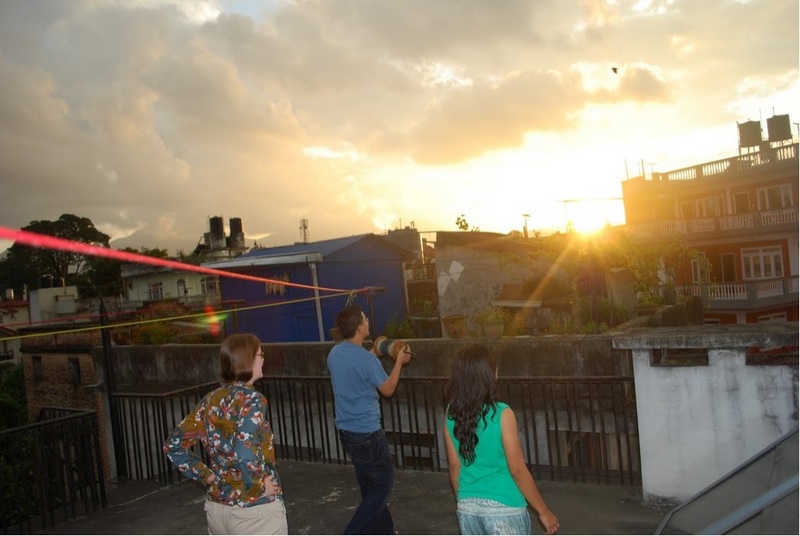 It’s the day that jamara is planted, and when kids take fragile paper kites to the roof. After Mamu’s morning puja in the prayer room at the top of the house she planted the family jamara seeds. She had explained last night that one of their neighbor’s used to work at the palace and would bring jamara back from the king, so for many years the family didn’t grow any, but they started again last year. It has been busy in the house, with many people coming and going. Daddy has been busy handing out packets of invitations for visitors to take back to their section of the city and distribute out to people P’s family knows. Although the household is buzzing with activity, P and I have felt relatively lazy. We have been sitting around, chatting with visitors, sitting on the roof and watching all the activity in the neighborhood, and helping Daddy call and contact guests. This morning I helped Mamu chop onions, mushrooms and tomatoes for the noon time meal. There has been a lot of rain, at least for a little while each day, but this morning was sunny and warm, while looking out the window P spotted several kites flying, and with a boyish enthusiasm declared that he wanted to fly kites as well. 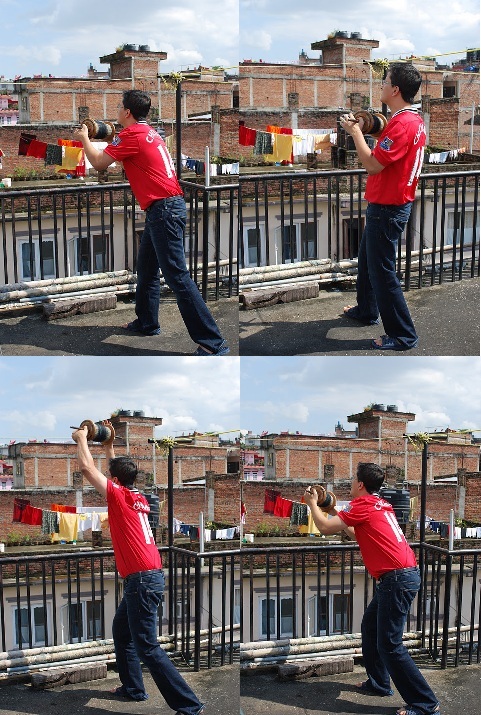 He started searching the house for spools of string and thin paper kites to take to the roof. I remember a few years ago someone left a copy of The Kite Runner at our house, and P picked it up. He’s not usually a reader, I’ve teased him that he’s been reading the same Jarrod Diamond book for five years, but this book he quickly got into, putting it down every now and then to reminisce about flying kites in his own youth, fighting kites with neighborhood children from the roofs of other houses. Once the book transitioned from the main character living as a boy in Afghanistan and making and flying kites with his friend, to a young man living in America, P quickly lost interest and tossed it aside. He never did finished it. So P dug through the cupboards until he found a spool of thick string and grinned, “this is very good string, from Lucknow.” He was about to yell out to the man cutting the grass (by hand with a curved sickle knife) to ask if he could run to the market to buy some kites, but Daddy said there were some stacked above the suitcases in the bedroom. P reached up to grab them, and pulled them down, lifting a cloud of dust. P got the kite fairly high into the sky, and explained we could potentially fight with other kites that we saw floating above several other houses. He asked if I would like to try, and I took hold of the spool. I didn’t have it for more than thirty seconds before the kite started dropping and spinning out of control. “I guess it takes skill and practice.” P answered, a bit of pride shinning through his voice. 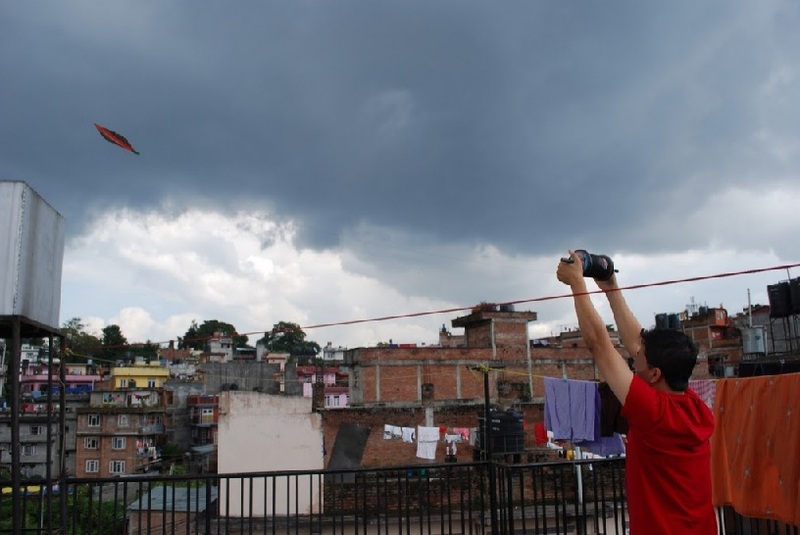 It took him a few moments to wind in the kite and get it under control, just as huge rain drops started to splatter on the roof indicating another shower was on its way. P pulled in the kite, and I grabbed the others, and we helped to take the laundry in off the line before it was soaked. Maybe I’ll have better luck tomorrow.